Lincoln East High School has 1 basketball gym and 1 football field. The main gym can be used as a multi-purpose gym as well. Spirit Park is part of the Lincoln Parks and Recreation, and has a total of 4 soccer fields. Spirit Park has a seating capacity of 15-20 people per field, and also has thousands of places to park. Nebraska Wesleyan softball team plays and practices at University Place Park off the NWU campus at 49th & Francis Street. A new scoreboard and bleachers were added to the park in 2009. 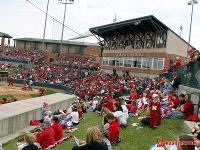 Bowlin Stadium is part of the 32-acre Haymarket Park complex that was built for $29.53 million in 2001. The 2004 SportsTurf Managers Association Field of the Year, Bowlin Stadium officially opened in 2002. In addition to the field and indoor practice facility, Bowlin Stadium also features a clubhouse, players' locker room and lounge, on-site medical facilities and coaches' offices.